I have one of the original geared 'Orange' pumps, which on a bench test involving sucking water out of a tin and into a drink water bottle leaked water everywhere. The bottle had a 1mm hole so the pressure build up was minimal, and on taking the pump apart water had passed through into the motor. Don't think the p/p was new when I was given same. David, there is a picture of yours on the facebook site showing a replacement 'orange' pump, do you have a contact for this, and how has it performed over time? I'm happy to purchase a windscreen p/p via e-bay, but as I require it to pump each way, I am uncertain how you tell from the picture which are one way impellor p/ps and which are bi-directional gear p/ps. Any advice would be well received. Roger, both of the pumps I have for Project 575 are from Halfords, just common or garden screenwash pumps, and both pump either way quite happily. re:MFA fuel pumps, they are unsuitable for water if you leave them standing the shaft rusts solid,the best pump is the good old blue or black pump,they will run on 6volt and are meant for water and are cheap. Roger,the orange pump is the one you want,I have just bought two and run them under presure until they stall,no leaks. Thanks to all who replied, have just e-bayed a red pump. Nigele, I notice from a picture of your 'x'craft that there are a couple of green relays behind the pump. Are these for pump control and if so do you have details, circuits etc? 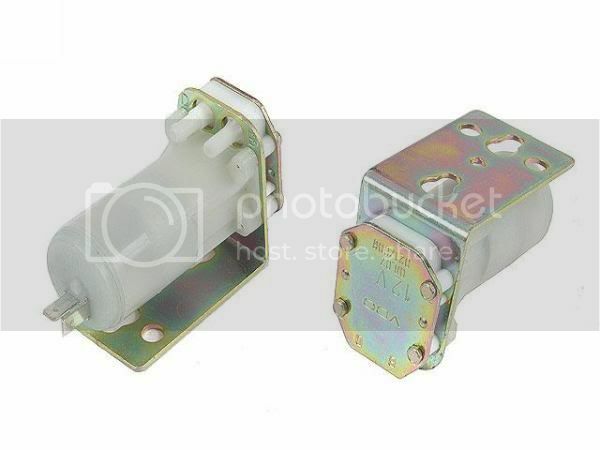 Also do people have a preference to these, rather than servo and micro switches? Yes Rog, the ebay red pump is the one, as per Nigel's comments. The one I bought last October has been used many times in my Charlie sub and is still going strong. There were remnants of some sort of glue. Would I still recommend them? Yes, it has had comsiderable use since October in my Charlie and UuPVC class. As you will see from the photo the standard of construction is pretty good. The pump also failed safe i.e I could not dive. I may try fixing the shaft with (Epoxy, Loctite Red ??) but will not use this particular pump in another sub. Would it be possible to sleeve the shaft with a sliver of alloy tube, maybe...then re-attach everything with a drop of superglue? You can see that there is a flat on the metal shaft which should help any glue type fix. I think I will try the Loctite Red approach(That stuff really locks shafts on) but there is no rush because I had a spare pump which is now fitted ready for Alfold. Sorry, I was looking at the wrong shaft...it's worth a try to salvage the pump, they are always useful for testing purposes. Glad you're operational again for Alfold though...look forward to meeting you. I am still a bit puzzled by the pump failure. If you look carefully at the photo, the motor shaft has a flat but there is no flat on the gear rotor. I've just had a look at a new pump and, of course,there is a flat on the shaft and the gear rotor. I think something may have got stuck in this pump, damaging the plastic rotor. Maybe the bit of "epoxy" I saw was actually some rubbish that damaged the pump. I think these pumps (which are rather important to a lot of us) are probably fine. I've just fitted a replacement and time will tell. Yes, but call me conservative. I (and Nigel!) only trust the red ones. what about a quite different approach for repairing the pump? 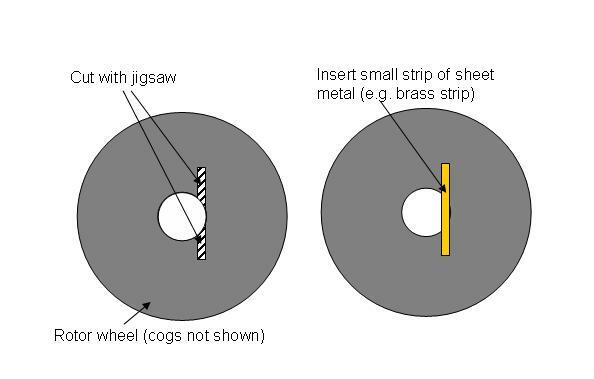 You might recreate a flattened area in the hole by the use of a small strip of sheet metal (as sketched in the picture below). Of course you have to be very skilled when making the small cuts with the jigsaw. But I think this repaired rotor will not wear down so quickly. p.s. Due to my experience glue is probably problematic to fix the rotor because the glue may chip off of may get loose when exposed to water for longer times. Super glue is not really waterproof for longer times. Thanks Hermann. That looks like a good repair method. But I'm afraid that when it comes to things that are needed to get your boat to come back to the surface - I get all "conservative" again! PS Sorry I haven't written in a while and it looks like the coach trip to the Dortmund show will be "on " next year. Volvo made some very good pumps, too. Yes, thanks for the information. The red pumpp arrived today from the ebay supplier I quoted earlier and they look fine. About £7 each including postage. I was testing ORP Dzik ready for the pond tomorrow. Pump was pumping and then suddenly made a much smoother, high pitched tone and stopped pumping. Taking it to bits showed that it had failed in the same way as the last one. 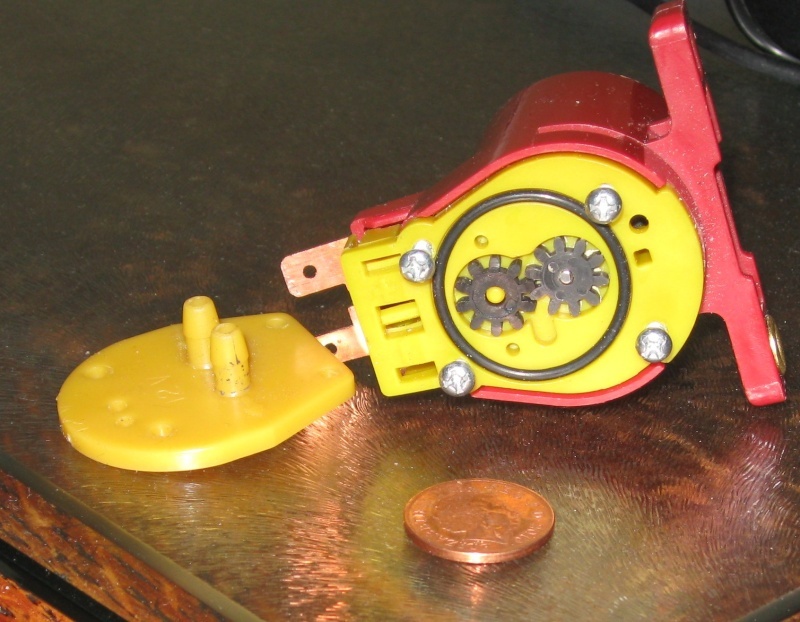 (The gear rotor starts to slip on the "flatted" motor shaft. If there is a plus side - I am getting quite quick at replacing them and they do fail safe! Just looking through this thread, I have had to replace 2 so far and they lasted for 9 months and then 5 months. They used to last 2 or 3 years. Lack of quality control...or lack of quality. I think that the plastic they are using is much softer. A pity - I will use up my stock and look for replacements or accelerate my piston tank programme! Hmm...I've just bought one of those.. I've sent some feedback to the supplier and hopefully manufacturer. A long shot but let's see what their response is.